Croismare Book of Hours and prayerbook, use of Rouen. Manuscript on vellum, illuminated by Robert Boyvin and workshop. 170 x 120 mm, 138 leaves, vellum. With 8 large miniatures in a golden architectural frame and 12 small miniatures. All small miniatures are accompanied by a gold panel in the outer border containing initials RI, or simply R or I. 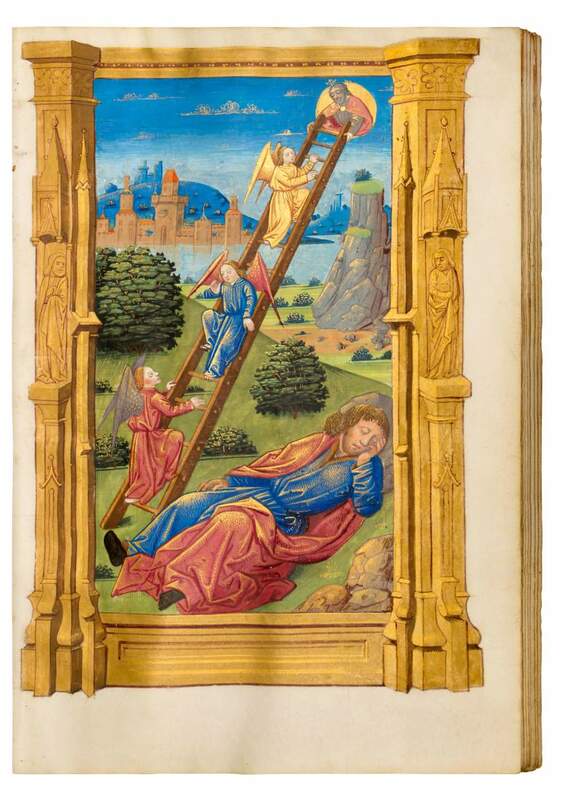 Book of Hours with unusual iconography. Calendar in French as well as some rubrics, otherwise all texts in Latin with male forms. Border decoration at the smaller initials consists of the initials RI, possibly the owner or recipient of the book. 170 x 120 mm. - 138 leaves. – With 8 large miniatures in a golden architectural frame and 12 small miniatures. With male forms and only one prayer (and the calendar) in French, the manuscript likely was made for a man. Use, illumination, and the later history of provenance all point to Rouen as place of origin and further use. The choice of prayers and iconographic programme indicate a special – perhaps learned – commissioner. Border decoration at the smaller initials consists of the initials RI, possibly the owner or recipient of the book. The first known by name is “Croismare”, a well-known family in Rouen. But the first owner (Robert, René?) cannot be identified with certainty, although the miniature of the Arma Christi may in itself be reference to Croismare – croix d’arme(s). The manuscript is most interesting as the iconographic program does not follow the usual pattern, with several Old Testament miniatures: from Genesis (Jacob’s dream), from Exodus (three scenes concerning Moses), Samuel (Nathan admonishing David), Kings (Solomon and the Queen of Sheba, Elijah and Elisha) and from the Book of Judith (Judith and Holofernes). Christ and the woman taken in adultery is also not commonly found (New Testament, Gospel of John). This, as well as some of the extra leaves inserted into quires suggests that the manuscript was an individual commission.